Investment in gold can be done in two ways - physical form (purchase of gold coins and bars through banks and jewellers) and through gold ETFs. Gold has been a preferable investment option for Indians because of its cultural importance in India. Families invest in gold to save for their child's marriage. Indians primarily buy gold jewellery and that makes India the second largest importer of yellow metal in the world. Investment in gold can be done in two ways - physical form (purchase of gold coins and bars through banks and jewellers) and through gold ETFs. The difference between gold and gold ETF’s are discussed below. Meaning An individual buys gold in the physical form. The purity of the gold may or may not be of minimum 99.5% purity. Gold ETFs are open-ended exchange traded funds that will invest the money in standard gold bullion (gold with 99.5% purity). An investor holds units of an ETF whose value depends on the price of the physical gold in the market. Pricing Pricing of the physical gold is not uniform. It varies from jeweller to jeweller. Gold ETFs are priced as per international standards and are always transparent. Investment Physical gold biscuits are available in the standard denomination of 10 grams that requires a huge investment. Gold ETFs are available in small quantities i.e. even in 1 gram. Hence, are more affordable. 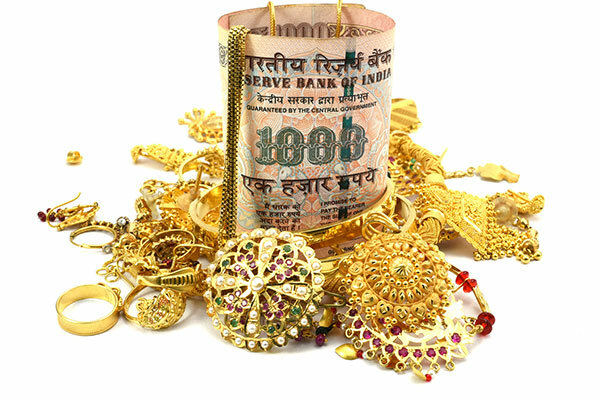 Charges When an investor buys gold jewellery, he has to pay 20%-30% of the total buying value of the gold as making charges. Buying a gold ETF includes expense ratio of only 1% every year and brokerage charges of ~0.5% or less of the purchase price with every transaction. Wealth tax 1% wealth tax is applicable if the value of the gold possessed by an individual is more than Rs 30 lakhs. There is no wealth tax applicable on Gold ETFs. Short-term capital gain tax If physical gold is held for less than 3 years then the investor has to pay a short-term capital gain tax as per his income tax slab. The short-term capital gain tax applicable for gold ETFs is same as physical gold. Long-term capital gain tax If gold is sold on profit after three years then the investor has to pay a capital gain tax of 20% with indexation. The long-term capital gain tax is the same as physical gold. Liquidity Physical gold can be purchased from banks and jewellers but can be only exchanged through jewellers. Buying/selling of gold ETF is much easier than physical gold as it is traded on the stock exchanges - NSE and BSE. Returns Actual return = Current price of a gold/coin minus buying price and making charges of an ornament. Actual return = Current price of a gold unit trading on stock exchange minus buying price and brokerage charges. Demat account Demat account is not required. An investor compulsorily needs a Demat account. An investor should invest in gold ETFs than physical gold because it carries no wealth tax and making charges. In addition, liquidity and convenience in transacting in gold ETFs is better than physical gold. The fear of buying physical gold at a higher price is eliminated in the case of buying gold ETFs as it is priced as per international standards. Therefore, one should prefer investing in gold through ETFs over buying physical gold. The author Rajas Pendnekar is a Blogger at IIFL.